One of the smallest, real mechanical musical movements in the world ! Shown next to a 20 pence piece. This miniature 17 note musical movement has been specially hand made with the Davy Jones & Tia Dalma musical locket theme tune from the film Pirates of the Caribbean. 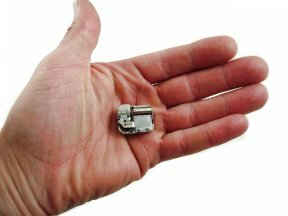 This is one of the smallest, real mechanical musical movements in the world measuring just 24 mm long. The picture shows a real 20 pence piece alongside to give a better perspective of it's tiny size ! Perfect for anyone wishing to make their own 'real' musical locket. Please note that due to it's miniature size it is only capable of playing a melody of approximately 8 - 10 seconds long - please listen to the tune sample to hear the whole tune. The movement will then repeat this tune until the stopper is pressed in or fully unwound. For more information on the musical movements, please click here.